Gronich, an attorney who moved here with her husband, Paul Nagle, in 1997, has been president of the nonprofit parade/concert/fireworks organizing committee Palisades Americanism Parade Association (PAPA) for three years—charged with raising nearly $150,000 a year to pay all the costs—and has said “yes” to various leadership roles at Palisades Elementary, Paul Revere Middle School and the Palisades Charter Schools Foundation. 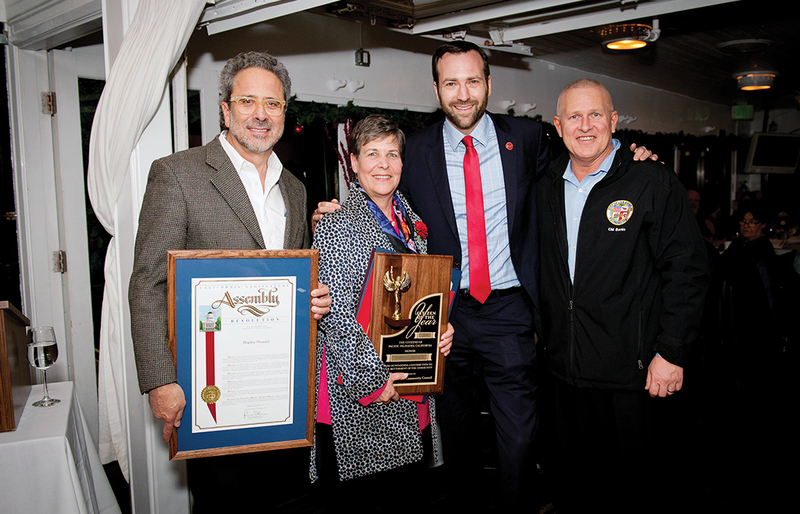 Citizen of the Year Daphne Gronich with Assemblyman Richard Bloom, State Senator Ben Allen and City Councilman Mike Bonin. 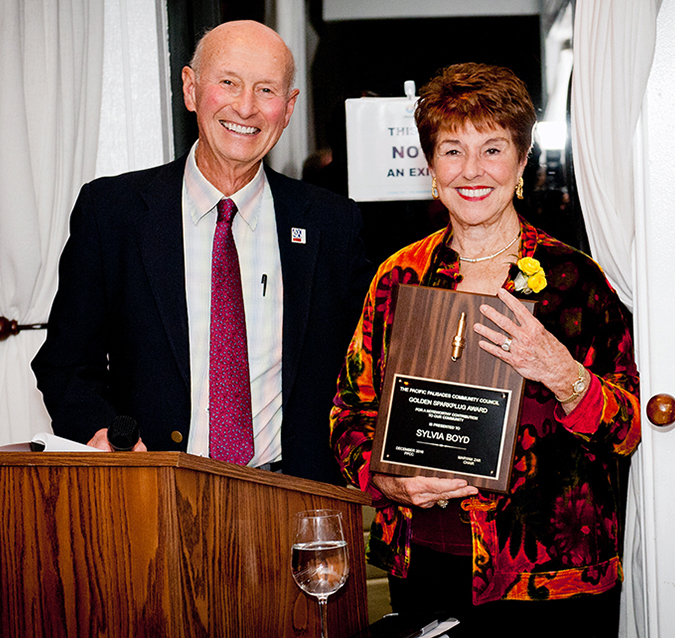 “I know that we all get back way more than we put in when we spend volunteer time and donate to support the organizations that enrich our lives,” said Gronich, speaking to an audience that included numerous past ‘Citizen’ and Golden Sparkplug honorees at Gladstone’s restaurant. The Citizen award has been handed out since 1947, and the Sparkplug award since 1974. 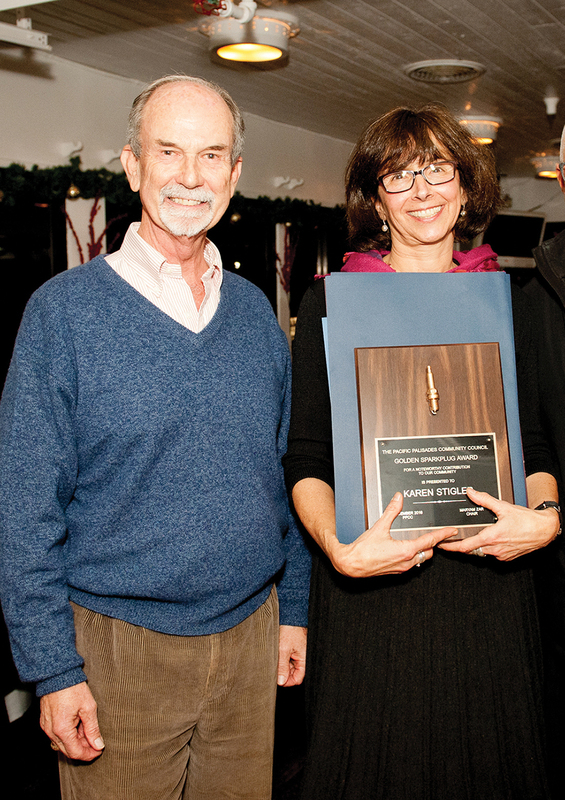 The Community Council also inaugurated the Pride of the Palisades award in 2014, presented this year to longtime businessman Bob Benton. 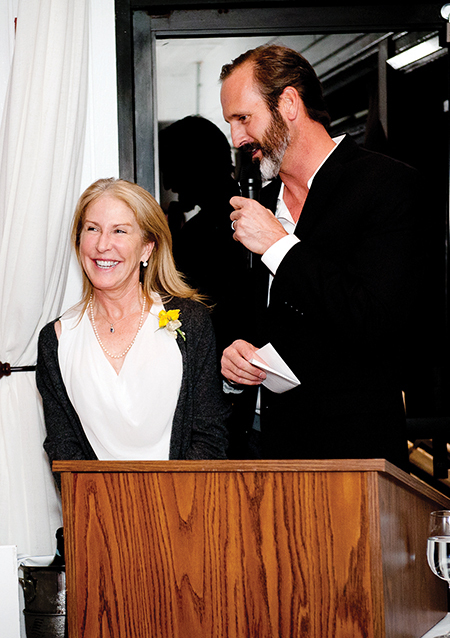 Sharon Kilbride (the 2015 ‘Citizen’) and Council member Bruce Schwartz introduced the first Sparkplug winner, Patrick Hart. They praised the Google mapping system he devised to monitor homeless encampments in the Palisades and facilitate and coordinate efforts by the Pacific Palisades Task Force on Homelessness, LAPD, LAFD, Recreation and Parks, and two OPCC outreach workers. Patrick Hart with his Sparkplug award. Hart said his personal involvement with the homeless was inspired by his mother’s work supporting Brother Benno’s Soup Kitchen in Oceanside, and a brush fire about 10 years ago that started in a homeless encampment below his home on the El Medio bluffs, overlooking Temescal Canyon. “The fire ignited our dry brush hillside and almost burned down our home and the homes of three of our neighbors,” Hart said. So when the Task Force on Homelessness was created in late 2015, he eagerly joined the cause. “In this task force, I have found a renewed purpose, an opportunity to [help with] re-housing our less fortunate, giving them a new start in life, off the streets . . . SAFE and warm,” Hart said. Sylvia Boyd, introduced by past ‘Citizen’ George Wolfberg, said that her Sparkplug honor should be shared by “the 26 interesting, inspiring, humorous, informative speakers” who have made her Food for Thought speaker series a popular monthly outing at the Palisades Presbyterian Church. Boyd founded the series in November 2014, came up with the title, and volunteered to organize a complimentary lunch before each speaker.“We are serving 50 to 110 guests a month,” she said, “and I’m now searching for 10 more interesting lives to complete our third year.” Contact syljonboyd@gmail.com for more information. Brian Deming, a PPCC Area 3 alternate, introduced Amy Lundberg, who led a community coalition, “Save the Bluffs,” that thwarted a developer’s plan to erect a 49- unit apartment building on geologically sketchy land at 16690-17000 Sunset Blvd. Brian Deming introduced Sparkplug winner Amy Lundberg. Karen Stigler and presenter Doug McCormick. Area 7 representative Cathy Russell noted that Veslemoey Zwart, chair of the Rustic Canyon Park Advisory Board, has sparked efforts to raise significant funding for the improvement and repair of deteriorated infrastructure at the city’s recreation center in the canyon, including the historically-landmarked, 95-year-old former Uplifters Clubhouse. Rustic Canyon activist Veslemoey Zwart. “Randy Young and the Palisades Historical Society, with architect George Taylor Louden, have given us the first stage of a historical restoration Master Plan to work off,” said Zwart, who has three production companies with her husband, Harald, for making movies and commercials. “We intend to follow this and do it ‘the right way.’” To make a donation, e-mail veslemoey@me.com. PPCC president emeritus Chris Spitz and a guy named Bill Bruns (who received the Pride of the Palisades award in 2014) introduced Bob Benton. They praised his enthusiasm, dedication and leadership skills as a businessman (his popular sporting goods shop on Swarthmore, founded in 1982, will be part of Caruso’s Palisades Village development) and as a volunteer at the Palisades Recreation Center. 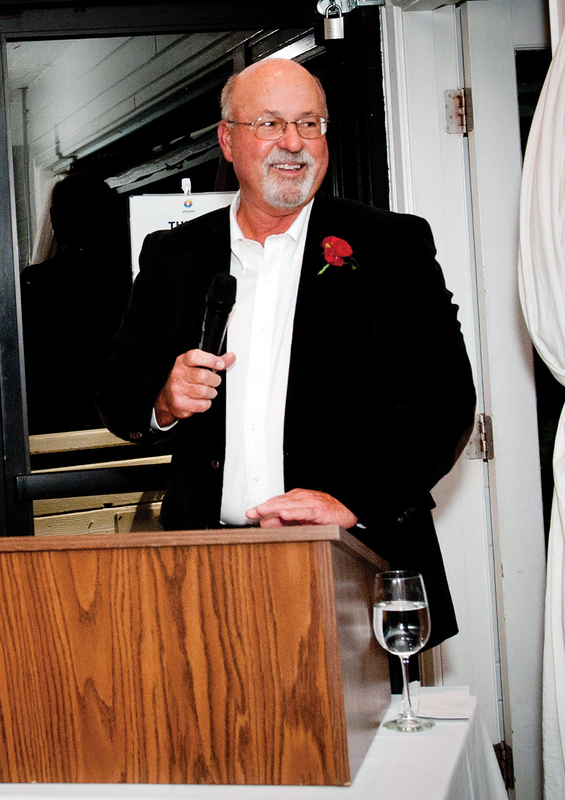 He has served as com- missioner of the Pacific Palisades Baseball Association since 1989, while also playing a crucial fundraising role for construction and ongoing maintenance of the park’s Field of Dreams complex. 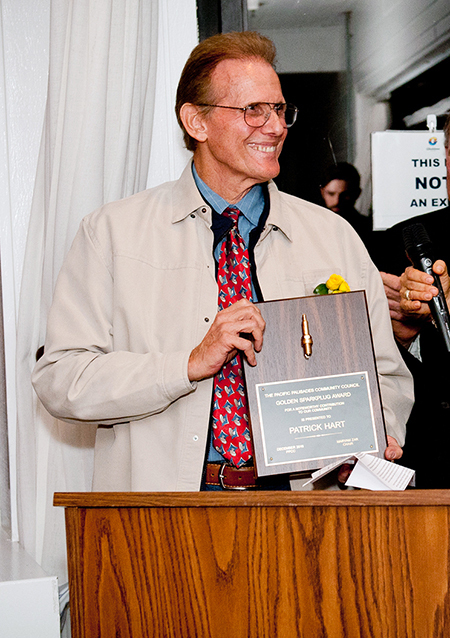 Benton, who is married to realtor Sue Kohl, said that after he moved to Rustic Canyon in 1982, his volunteer spirit was inspired by local activists such as Bob Hamilton (who led a campaign to re-engineer Sunset Boulevard through the canyon and improve traffic safety), Wally Miller (who helped create committees to fight signage/billboard blight in the business district and establish a Design Review Board), Brian Shea (who has co-chaired the Fourth of July Will Rogers Run for 40 years) and Mike Skinner, who masterminded the makeover of the playing fields at the Rec Center. “Hard work pays off,” Benton said. Early in the evening, PPCC Chair Maryam Zar made a special presentation to LAPD West Bureau Captain Tina Nieto, thanking her on behalf of the Task Force on Homelessness for supporting a year-round daily bike patrol on Will Rogers Beach and up into the Palisades. Zar led the Dinner Committee, Peter Culhane chaired the Events Committee and George Wolfberg oversaw the Awards Selection Committee.